Too much to read and I got ADD so I dunno if it has been said already but seeing that you an MBA I would have thought you had already considered this option! Get one of those fishing/hunting shirts with multiple pockets and buy all the pens you want - pocket for each pen! Learning from the past does not mean living in the past. That definitely did not come up until you posted it. Actually, I'm surprised it's taken so long for this idea to come up on FPN. Currently trying to sell a Pelikan M400 White Tortoise. PM if you're interested. Did you get it from vettedshop.com? They ship really fast and the service is great. I pulled the trigger on the Liliput, I'm now waiting for it to arrive from Germany. This will be my new work pen (incidentally, I had an interview yesterday, three interviews today, one tomorrow and one next Tuesday; so I believe I am really close to finding a new job). Then, while researching the Düller, I found that online dealer with those incredible conditions; I mean, $63 shipped to Canada, I could not resist, and I could not find a better deal later. So I pulled the trigger, too! This will probably be a FP kept in the collection, to be inked from time to time (especially since you, Chiaroscuro, wrote that the nib is disappointing; so right now I am buying this one for the design mostly; yes I do that! I was trained as an Industrial Designer, so these things are very potent for me!). Then, Laila from from Franklin-Christoph contacted me back to let me know they had found a rough red finial, and that they would, within a few weeks, be able to produce, specifically for me, a model 40PO in black and red (the sold out combo)! So I have pulled the trigger "virtually" and I am waiting a few weeks before payment and delivery. I have pulled the trigger so many times I am turning into a serial buyer! Then there is also the matter for the Kaweco I wanted; an eBay seller, that I had contacted earlier, contacted me back to let me know that the Kaweco Sport with the design that I wanted (the 1935 reissue with Guilloche) and with a F nib, would be available again in a couple of weeks. So I'll get that too, since it's very affordable. For the Passaportos I will wait until a bit later, maybe early 2013. I'm not sure I'll buy them since I don't want / need that many pocket pens. However, that deal I got proposed is so great, that it may be hard to resist. Edited by Xaltotun, 29 November 2012 - 03:01. That's Xaltotun, no 'i' but that's OK ... He's a bad, mean and scary villain in the original Conan The Barbarian pulps novels from Robert E. Howard . Another passion of mine, alongside Ian Fleming's (and subsequent pastiche authors) James Bond. I got the guilloche from iPenStore.com (they shipped very quickly). I think they still have some left. They didn't have F nibs, I looked everywhere on tha intarwebz! Literally spend a whole evening on this ... sad, eh? I have the TWSBI Mini but I didn't get to use it much before I had an issue with the nib assembly that took it out of commission. I should be receiving a replacement soon (2 actually: they offered me one after I had already purchased a unit). The dimensions are perfect, Xaltotun, but it doesn't look very professional IMHO because of the big red jewel. It depends on your work environment, I guess. The Mini posts amazingly because of the plastic O-ring on the threads, btw. I got the EF nib and it wrote a thicker line than the Kaweco F.
That's good to know; I usually go for F, so with TWSBI I would go with EF... Are all their models like that? I'll probably not buy the Mini, but sooner or later I know one of their models is going to get my fancy.... If you ever think about parting with one of the two you have, let me know, I might be tempted! I can't issue a real verdict yet, but seeing as though I have about five Kawecos now (got another AL yesterday, heheh), I'll have to say I like them better than the TWSBI. Is that the AL I am thinking about ? If yes, so it got there safe and sound? That was FAST! TWSBI doesn't ship to Puerto Rico either (through their site or eBay) but I was able to get the Mini and the nib on Amazon. TWSBI has everything for sale there at a slightly higher price, but they don't charge for shipping at checkout. Maybe that'll work for you too? Sorry to hear about your job. I hope everything goes well for you. Thanks for the kind words; I got a package (so financially I'm still OK, tight but OK) and check my previous post, most likely I'm very close to a new job. Sorry, bad habit brought over from WatchUSeek.com; there many people sign their posts with their first name and call each other with their first name in the posts (but almost never family name). Edited by Xaltotun, 29 November 2012 - 03:02. The eBay dealer I had contacted for the Tombow 101 Carbon, contacted me back as he just got one with F nib in stock. As he was at least €25 to €50 less expensive than other dealers online, and since he offered me free shipping if I ordered now, I took the plunge and purchased that fountain pen too. This is definitely turning into a binge! Gotta stop now! Here's three phone pics to show off my Blue Pigmy Newton. The first two show it in hand closed and open. The third shows it posted alongside a Danitrio Densho (can't post) and a Kaweco Ice (posted). As the third shows, once posted, the Newton feels full sized as its longer, and its section has a similar girth to, the Densho. The Kaweco, as great as it is, has a much thinner section. Edited by Xaltotun, 01 December 2012 - 18:00. Well, aesthetics should play a part. The pens that have been mentioned in this thread are all over the map in terms of style, and while they are a good size and practical, I've never bought a Kaweco simply because I find them to be an ugly pen. To each their own. Some see bloatedness others (like myself) see playful curves. The Newton's colorful acrylic and its curvy design (my choice) were selected for fun not seriousness. 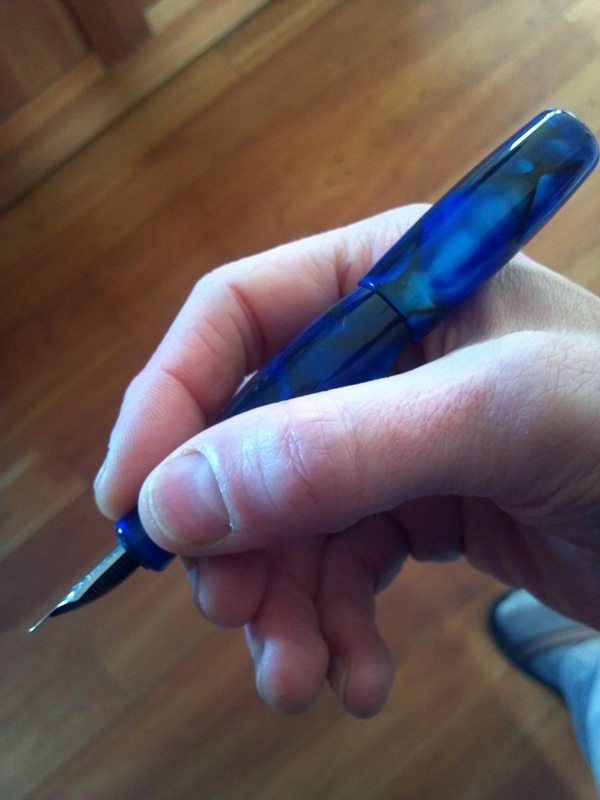 While it may look odd, the pen feels very good to write with. I love the Dani, the Newton, and the Kaweco but each for different reasons. I'm with you, Lloyd. A little zaftig is good. I love that description. Bloated. ... says the man whose "soul patch" bloated out into an official small creature. Have a look! Your eyes will love you. Thank you, Ken. 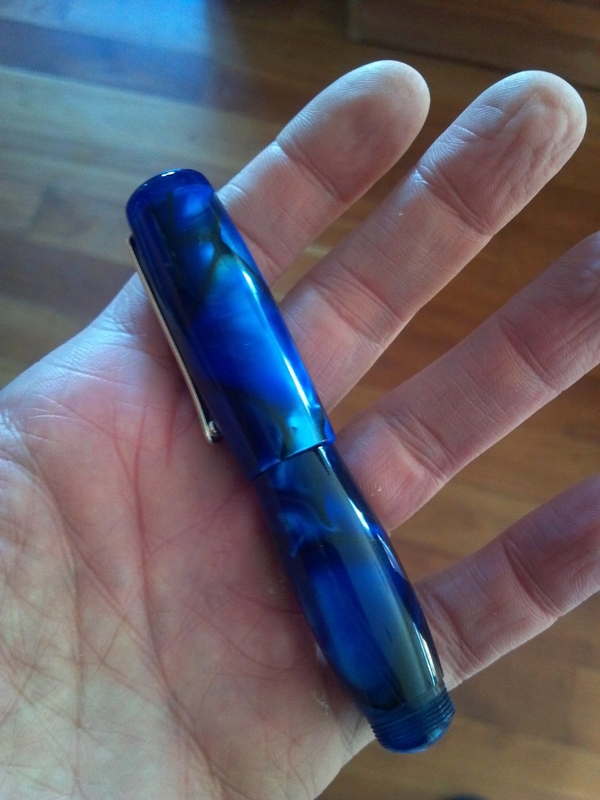 I previously wasn't in the market for another mini-pen, but my word, those are enticing! Well, the Kaweco Liliput has arrived. It is very well made, the tolerances and the engraving all point towards a great care in the manufacturing. I knew this Kaweco would be very well made, like all Kaweco are. For the price, they can hardly be beat! The size of the FP made me gasp . I knew and expected it to be very small, but I did not expect that small! Looks like a suppository!!! Seriously! I like it very much, and may use it as occasional shirt pocket pen, for jolting quick notes, but that's too diminutive to be used as everyday work FP.... Will lose it for sure! So it's going in the collection, as an example of a greatly designed FP. I have also received my Düller Fountain Pen; but that one, with its very very cool notebook/case, was always destined to be in my collection as an example of great industrial design, and was not destined to be a real, everyday "writer". So, on my way to an interview in an hour, I'm stoping at a dealer to pick up a Kaweco Sport... Back to basics it is! I'll probably pick up a plastic version, but you never know, I may also fall for a Carbon (they have it in stock). I will stay away for "pure" aluminum models, as they tend to have some kind of "play" in the cap once posted (aluminum on aluminum, it's not a tight fit), making it awkward for me. I am also waiting to purchase a custom-made Franklin-Christoph later in December (black with red finial), for my collection and for writing at home. Will probably pick up some Passaportos after that, in a few months. Edited by Xaltotun, 06 December 2012 - 17:37.